True Ski in/Ski out! Couples Ski Getaway! Perfect Location, Hot tubs and spa! Location, Location, Location AT The Snowflake Lift--TRUE ski in/ski out. You will love relaxing in our beautiful condo in a quiet location, just two blocks from town. As our dream place since 2003, guests love our amenities. At the end of a fun day on the slopes, nestle down in front of our stone fireplace, kick back, and relax. Enjoy a nice indoor hot tub/spa just a few steps down the hall, and luxuriate in one of our hot tubs, the steam room, or newly remodeled sauna. Outdoor hot tub too! Ahhh. For your evening activities, walk 2 blocks down the hill, or take a shuttle to take advantage of the nightlife in downtown Breck. In fact, if you book with us, we'll send you "Ted and Renee's Favorites List" of restaurants, bars, where to shop, what to do, and more! Ted loves beer, I love to eat, and between us both, we'll steer you in the right direction after the end of your day! When you aren't on the slopes, we have FAST, free, wireless, a flat screen TV with over 100 Satellite channels, a DVD player with a selection of movies, a stack of books for you to read, and a collection of games/puzzles. In addition to location being the best, our condo has many other amenities. We regularly update the linens, clean our bedspreads, and add decorative touches--such as extra pillows--for our guest's pleasure. I travel for a living and know that these small touches are meaningful to enhance a memorable, comfortable visit. Better than home! *Fully equipped kitchen with utensils, coffeepot, corkscrews, blender, toaster, etc. *A LOCAL property manager who can also serve as your concierge if you need lift tickets, rental equipment ideas, etc. ***This complex does NOT have air-conditioning. Ceiling fans and fans are provided. Our calendar is updated regularly for convenience. If you book both condos, we will provide you with a 10% discount. We also offer better pricing for extended stays. Both condos fill up every year, so please book online, or call for more information. Come and stay in our place! Best location in Breckenridge. Quiet, newer building perfectly situated just 2 blocks from town. There are only 47 units in this building, which is a huge advantage if you don't like crowded hot tubs and enormous numbers of guests clogging up building amenities during your vacation. Elevators. Secure garage. Guest ski lockers. Terrific amenities. Organic look and feel. BEAUTIFUL updated lobby & amenities. Laundry facilities, hot tubs, exercise center, just down the hall. Our newly remodeled lobby is a fantastic place to meet your friends and chill out in front of a fire and watch your favorite program on the oversized flat screen TV. Experience your mountain vacation the way it's meant to be--quiet, relaxing, and upscale. The natural woods, granite, slate, and friendly environment spells 'comfort', 'relaxation', and 'romance'. 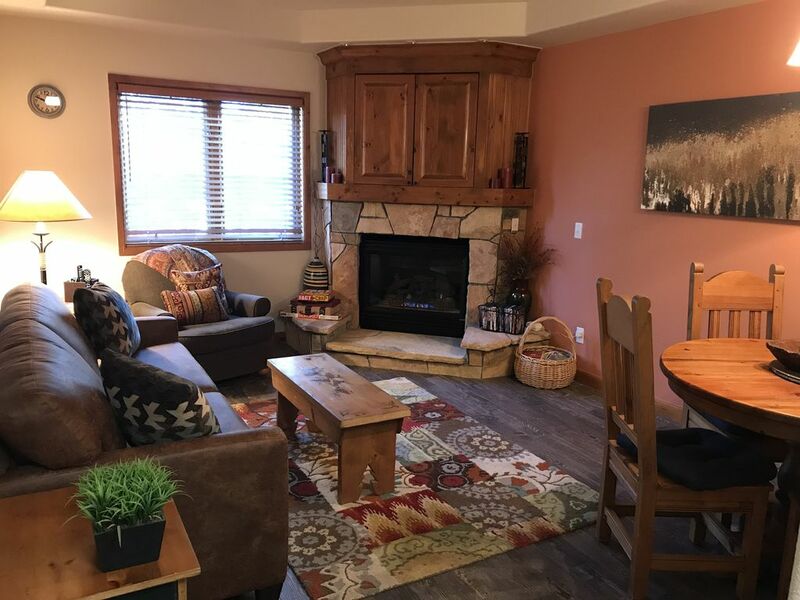 Experience Breckenridge from our condo and you'll have a memorable time! One bathroom has a commode and sink. The other bathroom has two sinks and a shower. TRUE ski in/ski out JUST 43 steps from the door! Shuttle rides and walking with skis not necessary. You're right there! Most locations in Breck are NOT ski-out. You are just 43 steps from the door to your condo. Great for families--Virtually NO walking or waiting for shuttles with gear. New linens, blankets, towels, and newly purchased QUALITY queen bed. Just 4 doors down the hall on the same floor. Bring quarters. Just 4 doors down the hall on the same floor. Stone. Gas. Beautiful and works well. Heated (!) garage parking in the building. Secure. Must be accessed with key. SECURE garage parking. Safe, clean. Immediate access to ELEVATORS from garage. Luggage carts in garage for guest use. VERY fast wireless and good connectivity. Fitness room about 5 doors down the hall with treadmill, weight machines, stationery bike, Satellite TV. Luggage carts available for guest use. Lovely living room with fireplace, comfortable furniture, dining table, rugs, accessories, games, tv, dvd player, and more. Dishwasher provided in the unit. Half refrigerator in kitchen. Ice maker is just 2 doors down the hall. Two top stove. Microwave oven. Microwave provided in the unit. Full size coffee maker and filters provided. New toaster for guest use. Coffee, tea, sugar, and coffee filters are available in small limited quantities as a courtesy to our guests. Small, but well equipped with microwave, two burner stove top, coffee maker, toaster, crock pot, blender, all kitchen utensils, pots, pans, dishes, flatware, etc. Shared grill. No oven in unit. Comfortable dining table seats 4 in living room. HD flat screen TV with satellite connection. Satellite tv with over 200 stations, DVD player, and DVD's available in your unit. New iPod docking station with radio. DVD player in unit. DVD's to borrow in condo unit, also. Selection of books and magazines to read and/or trade. Selection of board games, cards, and puzzles. We don't provide them, but you can store your bicycle in the locked garage. Shared patio with outdoor hot tub. Ski and snowboard equipment available next door to the condo, or just down the street. Store your gear in your locked ski closet off the garage. Available in Breckenridge near by. About 1/2 mile away from condo in public course. Just a few doors down the hall. Steam room, too. Recently remodeled and updated. Indoor and outdoor hot tubs. Hot tubs about 4 doors down the hall for easy access. Have jacuzzi tub in your condo unit. This is your fantasy romantic get away from home. , Beautifully appointed and in a quiet location-- but just 2 blocks from the fun downtown restaurants, bars, and shops with immediate access to the free shuttle. A warm, inviting fireplace greets you after a long day on the slopes and you're just steps away from hot tubs, steam room and saunas to relax your tired muscles. It just doesn't get any better than this! Very basic, no frills, very small, dorm-style place to stay. This place is a very basic dorm -style condo. Overall, the living area was inviting but not so comfortable with low lighting, one window, minimum natural light and a bright fluorescent light in the kitchen area. The view from the window was of the grill area and the opposite condos. No air conditioning so we opened the window and put the provided fan in the window, which worked great to cool the place. Although, we did hear many conversations as people grilled their dinners right outside the window. So much for taking a nap on the couch. Only one washcloth was provided for a 7 day stay... brand new towels and hand towels were delivered to us, (which was appreciated) but they were not washed. The bathtub was very tall and hard to step into. The ceiling fan above the bed was not used as it was full of dust which made the window fan work harder. The layout of the sleeping area was strange as the bathroom door hit the bed, so not a lot of room. Pillows on the bed were flat and hard (cheap) as was the mattress. The list of rules did not add to the ambiance at all. This place did not present a welcome feel. Nevertheless, we made the most of it while at the condo. We will return to this area for its great summer hiking but find a different place to stay. I do appreciate your review on our condo. I am glad you enjoyed the area and our wonderful summer hiking! It's certainly beautiful this time of year. The property is conveniently located right at the snowflake ski lift. The perfect ski in/ski out location during the winter cannot be understated. We continue to strive to ensure our guests have a great stay. We are pleased with our 4.6 rating out of 5 stars over all these years of doing business with VRBO. Thank you Collette for your review. We agree the location is perfect-and we do hear that frequently from guests. We were not aware of any smells in the fridge-darn it! We certainly could have sent someone over to see what was going on had we known. I do appreciate you mentioning it now. We have addressed it. The condo was well appointed, it had everything we needed. The amenities were great too, great building. Heated garage was a bonus. Steps from the snowflake lift. I would definitely rent again. Thank you Kiersten! I am so glad you enjoyed the condo and the perfect location! We would love to have you again! super convenient to the lift, very nice and cozy!! Garage parking is wonderful and amenities were great. Thank you Patrick for your nice review! The underground garage is a huge plus along with the ski in/ski out condo. Hope to hear from you in the future. The condo was nice, and is perfect for a couple or a couple with a small child. The location was awesome, just steps away from the lift. This made it very convenient to come in for lunch or for a little break. It was easy to get in and out of so that you could come and go very easily. Its also an easy walk down to main street for shopping and food. The only negative about this condo was the sleeper sofa, it was not comfortable for adults. GREAT location. Kinda small for 4 people. Overall, nice place. Would stay again. Super convenient location. Walk right out of the back door to SnowFlake lift. Ski right down 4 O’Clock run, pop your skis off, walk across the street and your home. Garage for parking was a VERY nice plus. You don’t have to deal with digging your car out of the snow or scraping your windshield when you’re coming and going. Steam room and hot tub were great after skiing / boarding all day. The only thing I can say negative is that it’s kinda small for four people and we could have used more wash towels... but, we just washed a load of towels halfway through our stay and it worked out fine. There is an on-site wash-a-teria ($2 wash, $1.50dry, bring your own laundry detergent). Overall GREAT place. We would stay here again. Beautiful condo perfectly situated just steps from the lift to Peak 8 and just 2 blocks from downtown. We have two condos in the same building, so contact us directly for additional availability. *"Welcome Packet" of Soaps, Coffee, Tea, Etc. Last-minute booking special rates may apply. Call 404 271.7438 or email: breckcondo7@yahoo.com We have two beautiful ski in/ski out properties in the same building, so contact for availability. Local management firm takes care of keys and all of your needs during your stay. Owner does not accept e-checks. Reservations are only valid if paid by credit card.